Absolutely worth an early vote! Beautiful work great idea! Instant Vote. Wow. Good idea, great execution. Perfect shadows. No less than phenomenal! Brilliant, brilliant peice! wow! the advantages of psc advantage! WOW ! what a fantastic job ! 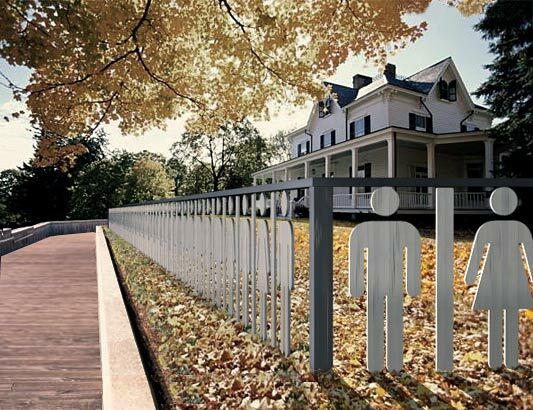 i WOULD mind a fence like this. How the h*ll is the head attached to the rest of the body ??? HaHa. Fantastic piece of work. Just another vote.. Not like you have any. The head is attached to the railing, duh! I tried to vote for this image twice. I'm a f*ckin pot head. If a photo, lame.. if photoshop, the best I've ever seen! One of my all time faves on this site.